Fall may be starting, but it still looks like summer at my supermarket. 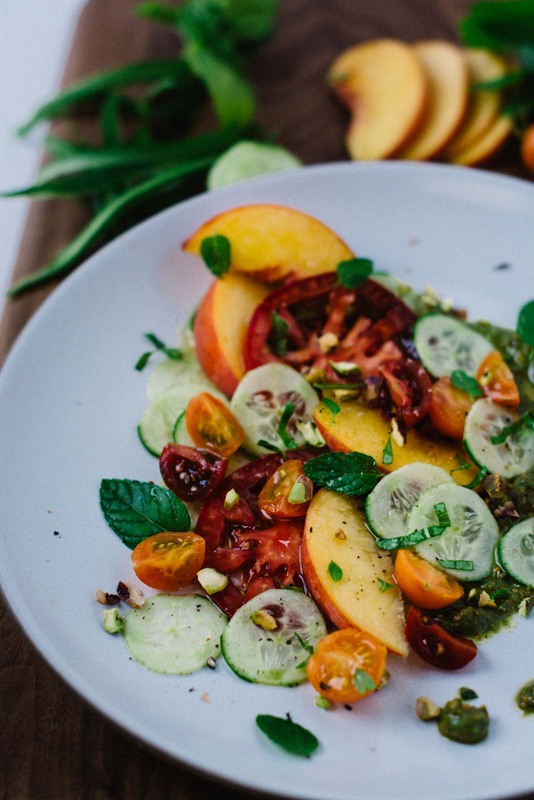 The heirloom tomatoes are still in abundance and peaches are at their peak. Salads that don’t have greens as their base is my favorite way to add variety and interest to what can be a bland and boring affair. 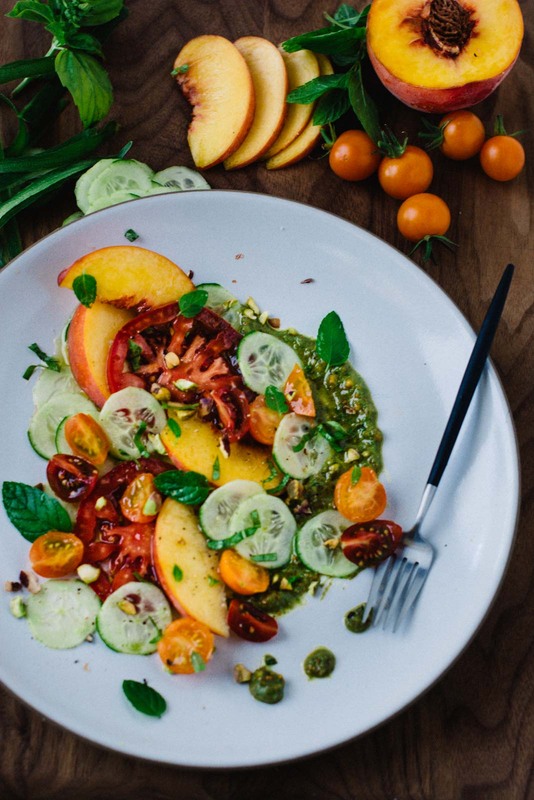 This heirloom tomato, peach and cucumber salad comes together in minutes and makes great use of all that great produce still available. Road trips have always been the stuff of nightmares in my experience. The last few weeks of summer before school started my son and I went on a two-week car trip down the coast from Oregon to San Diego. Spending that much time together every day for weeks I was expecting us to come home hating each other. Instead, it was an opportunity for us to do things that we would never do with otherwise. We toured colleges and ate a ton of sushi. With his dairy allergy most fast food is out of the question, so it’s nice to walk into a sushi restaurant and not have to worry about what hidden dairy bombs are lurking in the menu. We even found a great ice cream shop that uses liquid nitrogen to make you a custom ice cream flavor, and you can get a non-dairy coconut base which made my son beyond excited. I did a terrible job with my vegetable garden this year. I did get one beautiful heirloom tomato but had to satisfy myself mainly with lots and lots of Sungold cherry tomatoes. 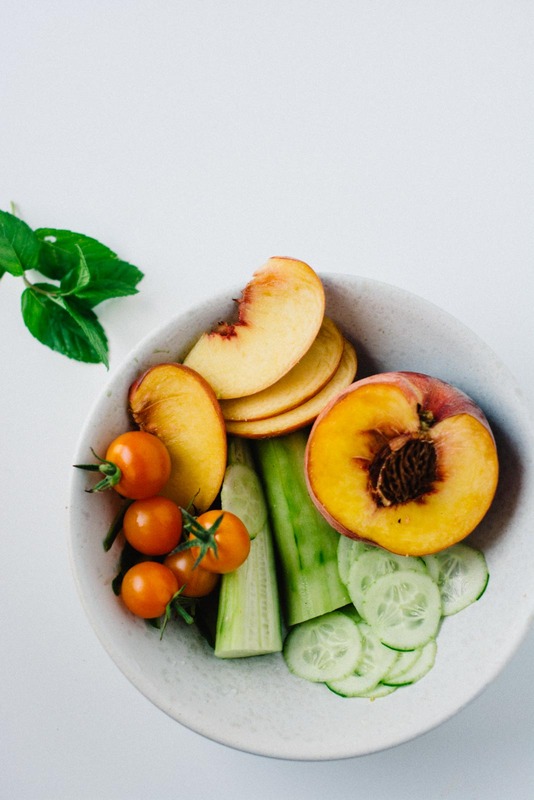 I’m ok with that, cherry tomatoes are my idea of nature’s candy and I love picking them straight off the vine and eating them while they are still warm from the sun. 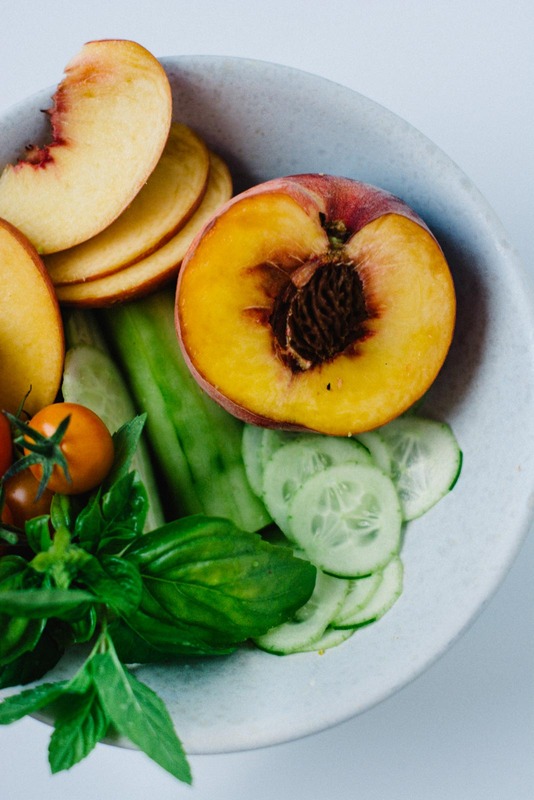 Using the best ingredients in this salad is crucial so a trip to the farmers market would definitely be recommended if you have access. 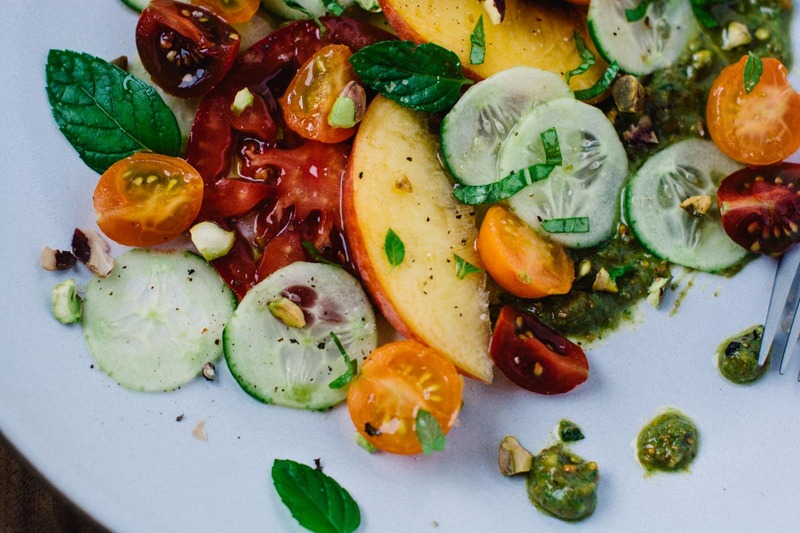 The pistachio basil vinaigrette brings the whole thing together. The recipe will yield extra dressing that you can spread on a sandwich, top some eggs with or swirl into hummus. 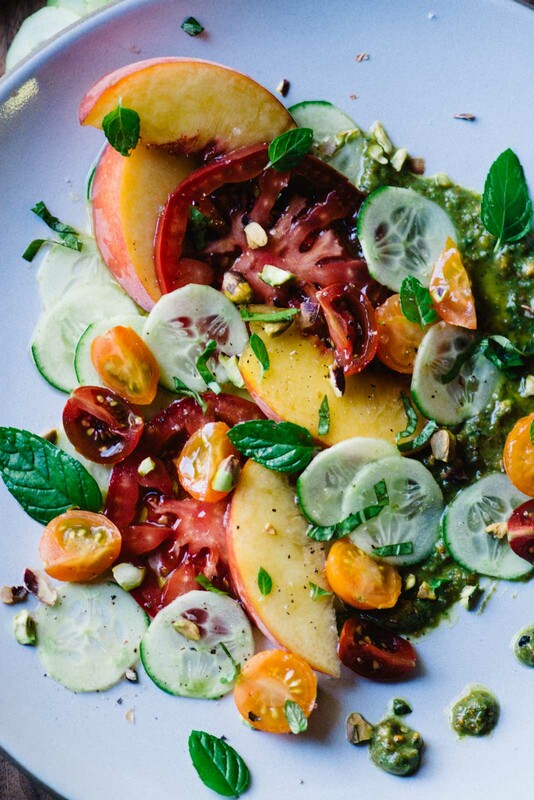 This heirloom tomato, peach and cucumber salad topped with a pistachio basil vinaigrette is a great way to use up all that summer produce! For the vinaigrette: Pre-heat the oven to 350 degrees. Spread the pistachios onto a lined baking sheet and roast for 5 to 10 minutes until fragrant but not burnt. Transfer all but 2 tablespoons of the nuts to a blender or food processor. Add the oil, vinegar, ½ cup water, basil, salt and pepper to taste, and blend the vinaigrette until smooth. 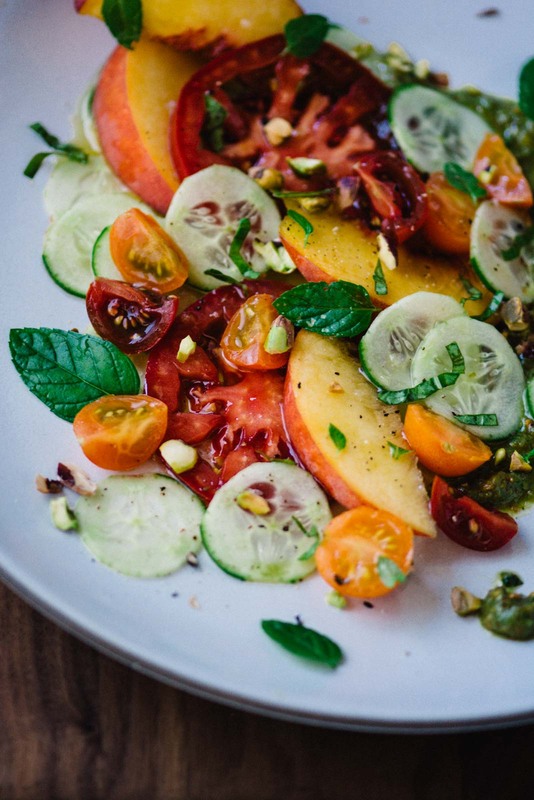 Finely chop the remaining two tablespoons of pistachios to sprinkle on top of the salad. Slice the tomatoes into thick slices if using large tomatoes or slice cherry tomatoes in half. Peel the cucumber and thinly slice. 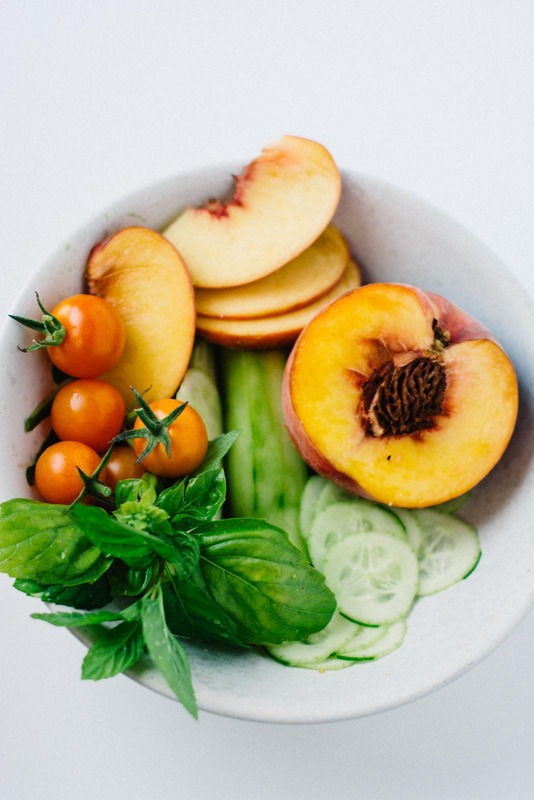 Cut the peaches in half, remove the pit and slice into ½-inch wedges. 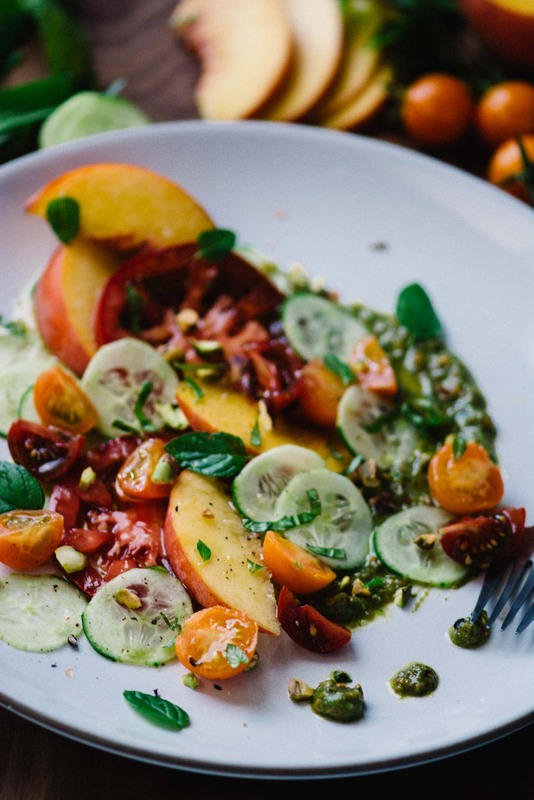 Layer the tomatoes, peaches, and cucumber onto a plate, drizzle with the dressing and top with the reserved pistachios and herbs.